The newly-appointed prime minister of Jordan has “strong Israeli ties”, according to reports in Arab media. Prime Minister Hani Mulki, who was appointed by King Abdullah II on May 29 after the king dissolved parliament, is being described as “pro-Israel”. Husam Abdallat, a former senior government aide at the prime minister’s office, told the Al Jazeera network on May 30 that Mulki will most likely be tasked with “attempting to engineer new negotiations” between the Palestinians and Israelis. “Mulki will be working to bring Palestinians and Israelis to the negotiation table and work to bring a final solution to the Palestinian cause which will most likely be at the expense of the Palestinian people,” he said. 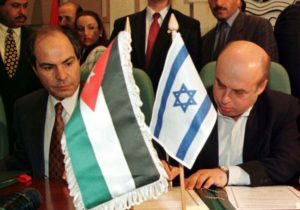 Mulki’s “strong ties” to Israel are said to stem from his role as chairman of the Jordanian government committee that negotiated with Israel from 1994-96. Al Jazeera noted that in one of the final acts of the outgoing parliament was the passing of the “investment law” which allows foreign countries, including Israel, to invest in strategic projects in Jordan, such as energy and infrastructure development. The majority of parliamentarians voted in a morning session against the inclusion of Israel in the law, but later in the day went on to rescind that vote. “Passing the investment law and allowing Israel to have control over our economics constitutes a serious threat to Jordan’s economic interests and its national security,” retired army general and columnist Mousa al-Odwan told Al Jazeera.